Communities and businesses across the Chichester District are joining forces with Chichester District Council in its fight against litter, fly tipping and dog fouling by 'adopting an area'. The council is launching the 'adopt an area' scheme as part of its Against Litter campaign in order to protect what is recognised as one of the most beautiful areas across the country. The Midhurst South Pond Group and the Selsey East Beach Pond Group are two community groups already making a difference in their local community by carrying out regular clean up events. 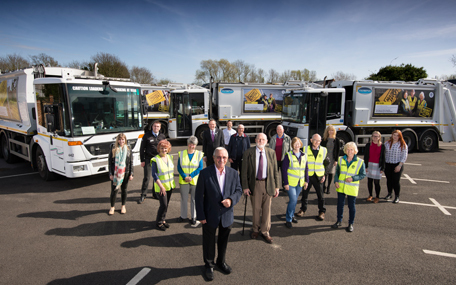 They will be unveiling new advertising panels on the council's recycling trucks, which feature and thank both groups for adopting an area, in order to mark the launch of the campaign. "We have so many community heroes who are making a huge difference within their local neighbourhoods and we want to build on this," says Cllr Roger Barrow, Cabinet Member for Resident Services at Chichester District Council. "We're asking people to 'adopt an area'. This could be a road, village, green space, shop frontage or area. As part of their pledge they would encourage others to take pride in their local area; report any problems to us, such as fly tipping, extensive littering or continuous issues of dog fouling; and help to keep the area clean by getting involved in, or organising, community clear ups. "We are not asking them to do our job for us. Instead, we are asking for their support and to be our eyes and ears in their local community. We look after one of the largest districts in the country - covering a total of 303 square miles. By working with us, we will be better able to respond to the issues facing our district. "I have already adopted an area close to my home and the rest of my cabinet colleagues at the council have done the same. We're also delighted that our MP, Gillian Keegan, is also backing the campaign and has already adopted the area outside her Chichester office. Waitrose, Everyone Active, Natures' Way, Bunnings and the Chichester Business Improvement District have also pledged to be part of the scheme, which is fantastic. "As things stand, we spend over £1 million a year keeping our district clean and tidy as well as cleaning up after those who ruin our environment. With the help of local residents and businesses, we can better utilise our resources by spending more time tackling the hotspots. If things improved significantly, there is also a possibility that we would be able to redirect some of the money we spend into more important community services," adds Roger. "I think this is a great initiative being led by Chichester District Council. We live in one of the most beautiful areas in the country and we want to keep it that way. We've got a great community spirit within our district and this is evident through the work that is already being carried out by local community groups and individuals. We want to build on this and encourage even more people to get behind this important campaign. I have already adopted an area and will be supporting the campaign as it moves forward." The 'Against Litter' campaign has already had a significant impact since it was launched last November. The first stage of the campaign involved trialling a litter enforcement scheme. In the first quarter of the trial over 500 penalty notices were issued to those who have been caught littering. "Since the campaign started, we've seen a reduction in the amount of litter we are collecting and the number of tickets issued - which is great news. All of the money collected from the fines has been paying for the service. We don't want to issue fines, but it does seem to be making a difference. We intend to continue monitoring its effectiveness as the trial continues," adds Roger. The council has set up an Against Litter section on its website and an area where people can sign up to adopt an area. Residents and businesses that sign up to 'adopt an area' will receive a special pack with advice, tips and information on the support that they will receive. "If people want to organise a litter pick, we will provide all of the equipment they need and will arrange to pick up the rubbish at a convenient location for the individual or group. This really is about working together. "We have so much more planned in the coming months, including launching a scheme to help tackle dog fouling in the summer. We are also planning to trial some new technology to make our service even more efficient. The key to the success of this campaign is about working with our local communities and encouraging them to help us to keep our district looking beautiful," says Roger.